The Strand Cruise, a new river cruise line in Myanmar, has announced details of two Christmas and New Year 2015 maiden voyages between Bagan and Mandalay, as well as a special launch offer valid for sailings from January-March 2016. During the Christmas and New Year 2015 sailings, each passenger booking at published rates can be accompanied by a companion sharing the same cabin on a complimentary basis. 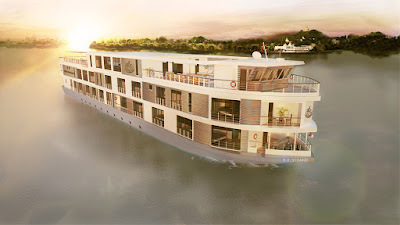 The two departures are scheduled for December 22 and 29, 2015, and follow The Strand Cruise’s regular four-night itinerary on the Ayeyarwady River between Bagan and Mandalay, with added inclusive experiences for its 54 guests, as well as a Golden Age of The Strand Christmas Day gala dinner or New Year’s Eve party. The first ten cabins booked on these two December sailings will also receive a complimentary hot air balloon ride over the ancient temple site in Bagan. Rates for the Strand Cruise’s four-night maiden voyages in December are from $3,592 per person and for each passenger making a booking, their companion sharing the same cabin will travel on a complimentary basis. Following its two maiden voyages, the ship will commence its regular schedule on January 4, 2016, offering three-night sailings from Mandalay to Bagan departing every Friday and four-night sailings between Bagan and Mandalay departing every Monday. There is a special launch offer available for sailings from January to March 2016 of 20 percent off the high season rate. During this time, the three-night journey between Mandalay and Bagan will be from $2,592 (usually from $3,240) per person based on double occupancy, and the four-night journey between Bagan and Mandalay will be from $2,874 (usually from $3,592) per person based on double occupancy. Shore excursions will take in Myanmar's major landmarks, uniquely offering a visit to the U-bein bridge on both north- and south-bound departures, and an exclusive mooring overnight at Ava on the four-night itinerary, allowing Strand Cruise passengers access to the temple of Maha Aungmye Bonzan after the crowds have departed from 5 p.m. until the following morning, when the monks of Ava will join passengers for a farewell. Rates quoted include all excursions and activities as described in the set itinerary, three meals during full sailing days, breakfast on day of disembarkation, soft drinks and local beer, house wine during meals, port charges, English speaking guides (alternative language guides can be provided on request subject to availability), satellite Wi-Fi in all cabins and public areas and complimentary international daily newspapers available on guest’s digital tablets. Passengers booking one of the two Strand Suites will have added extras included in their rate, including a one-hour spa treatment of their choice, a night at The Strand Hotel pre- or post- cruise and private airport transfers between The Strand Cruise and the airport.